Our galettes are made with organic buckwheat flour sourced from France. Buckwheat – a nutrient-packed, gluten-free seed abundantly consumed in Asian countries for centuries – is now becoming increasingly popular in the US, Canada and Europe due to its many health benefits. While most people think of buckwheat as a whole grain, it’s actually a seed that is high in both protein and fibre. It supports heart health and can help prevent diabetes and digestive disorders. In fact, buckwheat seeds, also called “groats”, are so packed with nutrients and antioxidants − like rutin, tannins and catechin − that they are often called “superfoods”. Improves Heart Health By Lowering Cholesterol and Blood Pressure Levels. High Fibre Content Helps Improve Digestion. Doesn’t Contain Gluten and Is Non-Allergenic. Supplies Important Vitamins and Minerals. At Crêpeaffaire, you can enjoy the buckwheat galette savoury or sweet. 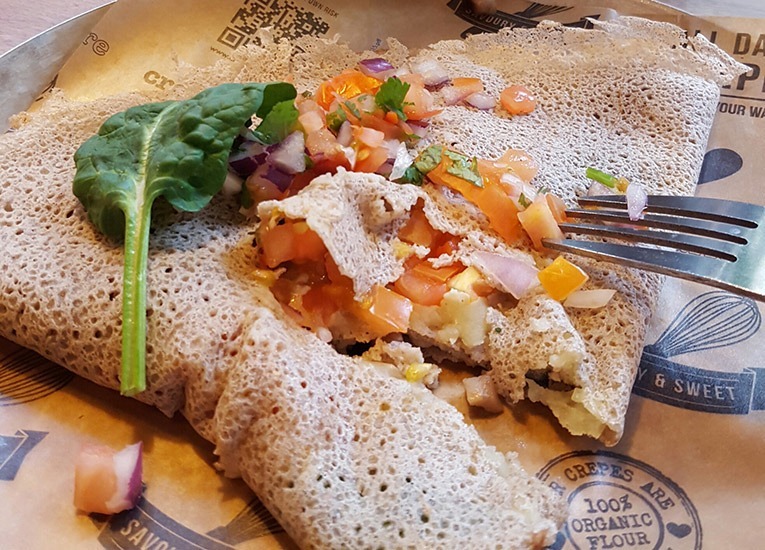 Our buckwheat galette is made with organic buckwheat flour, water salt and vegetable oil: it is naturally gluten free and dairy free (suitable for vegans). But most importantly the buckwheat galettes are delicious!